Photo courtesy of Ian Cox. If this is PooPoo, what is that brown stuff in hamburgers? What, no flies on top?! Perfect colour and texture, smells like it too. Don’t poo-poo it until you’ve tried it. Burger King: Have it our way. Would you like a Whopper with that? And try our fresh steamers! With a side of moth balls and a scouring pad. Looks like Shanghai got jealous of Tokyo’s “Golden Turd”. Available in combo number two. B.K.’s new splatter specials menu. – Mommy! I need to smoothie! I refuse to believe the “NEW” symbol’s shape is a coincidence. and here in North America, it comes with a big piece of Brownies. I always said, his taste was in his bum. Shanghai Maccas: Yu likee flies with that? Whoa, somebody ate a big breakfast! Don’t ask for the peanut special. Why PooPoo? Because man go. Also served in a bowel. “Change it up.” Bring a change, you’ll need it with the juicy bubble. – Here’s your smoothie. But if you’ll crap your hands, there will be no flies! Now you just need to find two girls! By the way, 爆爆珠 is “bao bao zhu” (sorry, not actually pronunced “po po”), which translates to “exploding pearls”. I think they are little gelatine balls filled with fruit juice. But “poo poo” is the awesomely funny! Now with 90% more diarrhea! 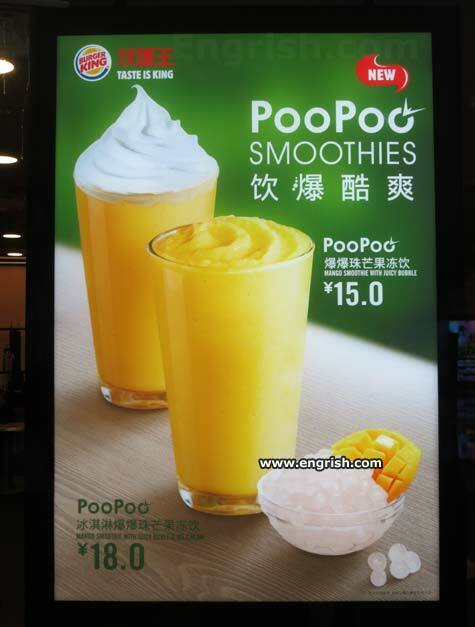 Better your PooPoo Smoothie than hard, dry, and difficult to pass.